Frank Lloyd Wright (June 8, 1867 – April 9, 1959) was an American architect, interior designer, writer and educator. He designed more than 1,000 projects, of which more than 500 works were completed. Through much of his career, Wright promoted the concept of organic architecture. He was a leader of the Prairie School architectural movement and developed the concept of the Usonian home. His work includes original and innovative examples of many different building types, including offices, churches, schools, skyscrapers, hotels, and museums. Frank Lloyd Wright was born in the farming town of Richland Center, Wisconsin, in 1867. His father, William Carey Wright (1825 – 1904), was a locally admired orator, music teacher, occasional lawyer and itinerant minister. His mother was Anna Lloyd Jones (1838 – 1923), a county school teacher. When his mother was expecting him, she declared he would grow up to build beautiful buildings. She did whatever she could to encourage this aspiration. When he was an infant, she decorated his nursery with engravings of English cathedrals torn from periodicals. When Wright was nine, she bought him a set of building blocks, known as Froebel Gifts. He spent much time playing with these geometrically-shaped blocks and assembled them in various formations. These exercises would have an effect on his approach to design, as many of his buildings are notable for their geometric clarity. Soon after Wright turned 14 his parents separated. The divorce was finalized in 1885. Originally named Frank Lincoln Wright, he changed his name after his parents’ divorce to honor his mother’s Welsh family, the Lloyd Joneses. Wright attended a Madison high school. He was admitted to the University of Wisconsin – Madison as a special student in 1886. After two semesters, Wright left the school in 1887 without earning a degree. That same year, he went to Chicago in search of employment. Because of the destructive Great Chicago Fire of 1871 and a sudden explosion in population, new development was abundant in the city. Within days, he was hired as a draftsman with the architectural firm of Joseph Lyman Silsbee. Other draftsmen that also worked for Silsbee at the time included future fellow Prairie School style architect, George G. Elmslie. While Silsbee was predisposed mainly to Victorian and revivalist style architecture, Wright sought more progressive work. After less than a year there, he moved on to become an apprentice in the Adler & Sullivan firm. Sullivan took a liking to Wright and bestowed him with great design responsibilities. He soon earned a private office, which he shared with his old friend and draftsman George Elmslie – hired by Sullivan at Wright’s request. He continued to do well and earned a 5-year contract, rising to the position of head draftsman. Also in charge of all residential design work done in Sullivan’s office, he collaborated on five houses, two of which are still standing. Wright was continuously short on funds, though his poor finances were likely due to his expensive tastes in cars and clothing. To supplement his income, he accepted independent commissions for at least nine houses, conservatively designed in variations of the Queen Anne and Colonial Revival styles. Eight of these early houses remain today. His “bootleg houses,” as he called them, had a dual effect of getting him fired and truly launching his career. Sullivan learned of Wright’s independent works in 1893 when he recognized a house that was unquestionably a Frank Lloyd Wright design. Since Wright’s contract strictly forbade outside projects, the episode led to his departure from Sullivan’s firm. Wright then established his own practice in Chicago with his old colleague Cecil Corwin, who eventually decided he did not particularly like architecture and went on in search of a new profession. With both Sullivan and Corwin gone, Wright moved into the newly completed Steinway Hall Building in 1894. The space was shared with Robert C. Spencer, Jr., Myron Hunt, Dwight H. Perkins, and Perkins’ apprentice Marion Mahony. These young architects, inspired by the philosophies of Louis Sullivan and the Arts and Crafts Movement, formed what would eventually become known as the Prairie School. Mahony was the first licensed female architect in the United States. She also designed furniture, leaded glass windows, and light fixtures, among other features, for Wright’s houses. Between 1894 and the early 1910s, several other leading Prairie School architects and many of Wright’s future employees launched their careers at Steinway Hall. Wright’s projects during this period were either Sullivanesque in decoration with Wright’s usual emphasis on simple geometry and horizontal lines, or more traditional dwellings in Dutch Colonial Revival, Tudor Revival, and Queen Anne styles. As an emerging architect, Wright could not afford to turn down a project over disagreements in artistic preference, but even his most conservative designs retained scattered Sullivan inspired details. By 1901, Wright had completed about 50 projects, including many houses in Oak Park. 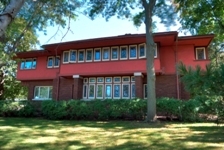 Between 1900 and 1901, Frank Lloyd Wright truly honed the Prairie School Style and heralded its appeal. During this time, he completed four houses which are now considered the first of the Prairie style. Simultaneously, he distributed his new ideas for the American house through two publications in the Ladies’ Home Journal. The articles were in response to an invitation from Curtis Publishing Company President Edward Bok as part of a project to improve modern house design. “A Home in a Prairie Town” was published in the February 1901 edition and “A Small House with Lots of Room in it” appeared in the July issue of the same year. Although neither of the house plans were ever constructed, more people requested similar designs in the years to come. Wright’s designs were “Prairie Houses” because their horizontal lines were intended to complement the land around Chicago. These houses were typically low buildings with gently sloping roofs, clean outlines, and built using unfinished materials. Plans for these homes were custom made to integrate with the existing landscape on their lots, as opposed to trying to change the land to suit the dwelling. The interiors of Wright’s Prairie School style homes were just as different from traditional styles as their exteriors were. These houses are the first examples of the “open plan,” which developed out of necessity at the turn of the 20th century when servants began to disappear from most American households. By developing homes with more open plans, the woman of the house could be cooking or cleaning in the kitchen, while still keeping track of the children or guests in the next room. In fact, much of modern architecture can be traced back to Wright’s innovative work. Beyond the manipulation of space, Wright concerned himself with organic architecture down to the smallest details of his designs. Whether it was a large commercial project to a relatively modest house, Wright conceived basically every detail of a project’s design, internally and externally. His Prairie houses use themed, coordinated interior design elements that are repeated in windows, carpets, furniture, doors, tables, chairs, light fittings and decorative elements. He was one of the first architects to design and supply custom-made, purpose-built furniture that functioned as integrated parts of the whole design. Wright was also one of the first architects to design and install custom-made electric light fittings, including some of the very first electric floor lamps and then-novel spherical glass lampshades. He made innovative use of new building materials such as precast concrete blocks, glass bricks and zinc cames for his leadlight windows. As Wright’s career progressed, so did the mechanization of the glass industry. Wright fully embraced glass in his designs and found that it fit well into his philosophy of organic architecture. Glass allowed for interaction and viewing of the outdoors while still protecting from the elements. During the later 1920s and 1930s Wright’s Organic style had fully matured with the design of the Graycliff Estate, Taliesin West, and the legendary Fallingwater. One of Wright’s most famous private residences, Fallingwater was completed in 1937 for Mr. and Mrs. Edgar J. Kaufmann Sr., at Bear Run, Pennsylvania. To place the occupants close to the natural surroundings, Wright designed it with a stream and waterfall running under part of the building. The construction is a series of cantilevered balconies and terraces, with limestone used for all vertical structures and concrete for the horizontals. Taliesin West, Wright’s winter home and studio complex in Scottsdale, Arizona, was a laboratory of sorts for Wright from 1937 to his death in 1959. Now the home of the Frank Lloyd Wright Foundation and archives, it continues today as the site of the Frank Lloyd Wright School of Architecture. In addition to helping invent the Prairie School style of architecture, Frank Lloyd Wright single-handedly created a building philosophy known as Usonian. Usonian is a term that usually refers to a series of approximately sixty middle-income family homes designed by Frank Lloyd Wright beginning in 1936. Usonian Homes were typically small, single-story dwellings without a garage or much storage, and often L-shaped to fit around a garden terrace on odd lots. They were constructed native materials, flat roofs and large overhangs for passive solar heating and natural cooling, lots of windows for natural lighting, and radiant-floor heating. The Usonian design is considered among the aesthetic origins of the popular “ranch” tract home popular in the American west of the 1950s. Frank Lloyd Wright was interested in site and community planning throughout his career. He had 41 commissions on the scale of community planning or urban design. Wright is also responsible for a series of concepts of suburban development united under the term Broadacre City. His commissions and theories on urban design began as early as 1900 and continued until his death. Wright authored 20 books and many articles, but his colorful personal life often resulted in his name being in the headlines rather than the bylines. He was also a popular lecturer in both the United States and in Europe. Frank Lloyd Wright died on April 9, 1959 while undergoing surgery in Phoenix, Arizona to remove an intestinal obstruction. Late in his life and for a long time after his death, Wright received much honorary recognition for his lifetime achievements. He received Gold Medal awards from The Royal Institute of British Architects in 1941 and the American Institute of Architects in 1949. He was awarded the Franklin Institute’s Frank P. Brown Medal in 1953. He received honorary degrees from several universities, including the University of Wisconsin, and several nations named him as an honorary board member to their national academies of art and/or architecture. He was recognized in 1991 by the American Institute of Architects as “the greatest American architect of all time”. In 2000, Fallingwater was named “The Building of the 20th century” in an unscientific “Top-Ten” poll taken by members attending the AIA annual convention in Philadelphia. Frank Lloyd Wright was married three times and fathered seven children, four sons and three daughters, and one adopted daughter. His interest and success in architecture has seemingly been inherited by his progeny. His son, Frank Lloyd Wright Jr., went on to become a notable architect in Los Angeles. Eric Lloyd Wright, Wright Jr.’s son and Wright Sr.’s grandson, is currently an architect in Malibu, California. John Lloyd Wright, another son and architect who practiced extensively in the San Diego Area, invented Lincoln Logs in 1918. John’s daughter, Elizabeth Wright Ingraham, is currently an architect in Colorado Springs, Colorado. Her daughters are Christine, an interior designer in Connecticut, and Catherine, an architecture professor at the Pratt Institute. A great-granddaughter of Wright, Melissa Galt, currently lives and works in Atlanta as an interior designer. A great-grandson of Wright, S. Lloyd Natof, currently lives and works in Chicago as a master woodworker who specializes in t custom wood furniture.